The 2012 Isle of Man TT came to a close today with the already postponed Senior race being cancelled for the first time in the event’s 105-year history. A course inspection by race control and rider representatives, including Honda TT Legend John McGuinness, deemed the race unsafe to go ahead due to poor weather conditions. The decision meant that McGuinness was unable to challenge for his 20th Isle of Man TT victory, but the ‘Morecambe Missile’ goes home happy having won both the Superbike and Superstock races to increase his tally of wins to 19. Race fans that lined the Isle of Man streets were treated to a parade lap by McGuinness and MotoGP star Cal Crutchlow. I think it was the right decision to cancel the race today. I’d love to be here tomorrow waiting for the sun to shine so we can race, but that’s not an option and for me, the track just wasn’t quite right. Racing my favourite bike here, starting at the front and possibly winning races is the best thing in the world, but I’m also really nervous about riding the big bikes in patchy and damp conditions. It’s disappointing for everybody but tomorrow’s another day and we’re already looking forward to next year. 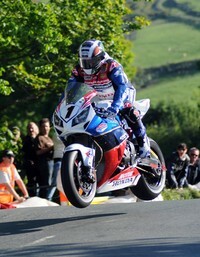 The 2012 TT has been a successful one for Honda, with the manufacturer’s machines gracing the podium 11 out of a possible 18 times. Both the Superbike battle and the first Supersport race ended with a Honda 1-2-3, and McGuinness’s win in the Superstock class with Padgetts Racing took the tally of Honda TT wins to 163.